The Nature Conservancy of Canada (NCC) has an exciting opportunity to conserve part of the Avalon Peninsula coastline at Freshwater Bay, just minutes from St. John’s. 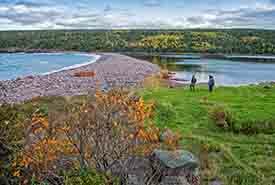 The 243-acre (98-hectare) privately owned property is a popular outdoor destination, and includes a spectacular section of the East Coast Trail along the northern hiking route to Cape Spear. NCC wants to make sure this outstanding property remains in its natural state and is always available for public use and enjoyment. As well as an excellent area for recreation, this is an ecologically important coastal forest that provides habitat for many species and shelter for nearby seabird colonies. Thanks to a generous local landowner, NCC has an extraordinary opportunity to conserve this coastal habitat and create an urban nature reserve for St. John’s. NCC needs community support to make it happen! Call our St. John’s office at 709-753-5540 to find out how you can contribute. Or to make a tax deductible contribution online: click the “DONATE” button in the top right corner of your screen. On the payment page, you'll see an option to enter a comment about your donation — enter “Freshwater Bay Project” to ensure your funds are directed appropriately. Together we can create a natural legacy for habitat and future generations. NCC may direct all or a portion of gifts committed to this project to NCC’s Stewardship Endowment Fund. Revenue generated by the Stewardship Endowment Fund provides for long-term management of properties across Newfoundland and Labrador, including Freshwater Bay in the Avalon Peninsula Natural Area. In the event that this project becomes fully funded, your gift will be allocated to the next urgent priority in this Natural Area.